Lightweight and compact size, portable. Cut potatoes quickly, convenient for use. Microwavable, easy for make French fries, a good helper in kitchen. 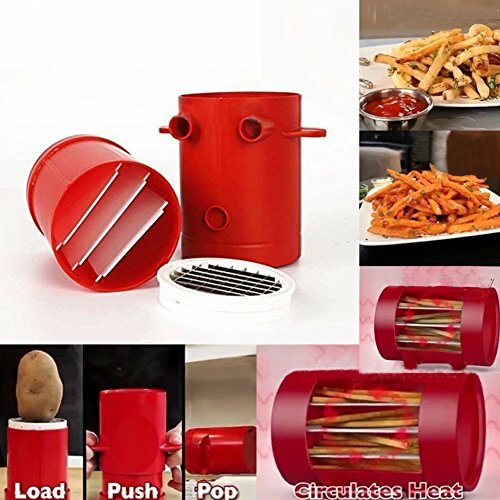 【News Design French fries maker】 French fries cutter machine and microwave container 2-in-1,No need to deep-fry to make healthy fries. 【Simple make the delicious & fresh French fries everyday】One-step cutter slices potatoes or almost any veggie into perfectly shaped fries,Just load,perfect down to cutting the potato in to fries,in perfect size to cutting differece size potatoes, pop in microwave, in just minutes, the delisious crisp fries is done. 【Creative Different ingredients&different tastes fries】Get creative when making sweet potato fries, zucchini fries, onion fritters, apple fries and many more， After taking it out of the microwave, you can mix different spices such as cheese and basil, depending on your taste. If you have any questions about this product by MEIBY, contact us by completing and submitting the form below. If you are looking for a specif part number, please include it with your message.